Aveley mum Norinda Rossi with eight-month-old Chiara and two-year-old Luca. Photo: Supplied. PERTH mums are teaming up with Telethon Kids Institute researchers to develop a world-first vaccine. The Maternal Respiratory Syncytial Virus (RSV) Study is being run as part of an international effort involving thousands of women from 11 countries, aiming to protect newborn babies from RSV when they are most vulnerable. RSV can be life-threatening for newborns. It infects the lungs and airways, and is one of the most common reasons babies are admitted to hospital. “We believe the key to protecting babies from RSV is giving a vaccine to mothers late in pregnancy, and this will provide the necessary antibodies to build immunity during the first few months after birth,” he said. Aveley mum Norinda Rossi found out about the study through her midwife and was keen to get involved. 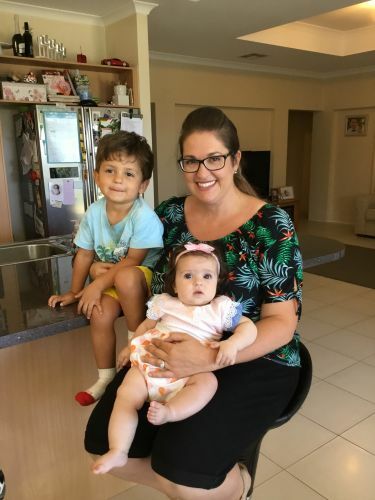 “I’m all for immunisations, and seeing a family member’s niece spend two weeks in Princess Margaret Hospital with bronchiolitis showed me how beneficial it would be to have a vaccine available,” she said. Mrs Rossi was pregnant with her now eight-month-old daughter Chiara when she became one of 3000 women who signed up to participate. The Maternal RSV Study is now in its third year, and is looking for women between 18 and 40 who are due to give birth between now and June 30, 2018. For more information, call the Vaccine Trials Group study staff on 0439 783 610 or email maternalrsv@telethonkids.org.au.